Cordiner's Land is an historic building, which occupies an ancient site within the World Heritage Trust area of Edinburgh's Old Town. Early maps of Edinburgh in the Middle Ages show buildings clustered around this location, which was the Western gate (West Port) into Edinburgh through the Flodden Wall (remaining sections of the Flodden Wall can be seen nearby). Historic Scotland included Cordiner's Land on its Statutory List, with Category C(s) Listed status, on 10th April, 1986. The building features distinctively Scottish architecture, crowstepped gables and, possibly its most notable feature, the decorative stone panel of the ancient Cordiner's Guild. 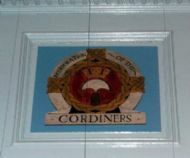 This reinstated emblem of the Cordiners is important to Edinburgh's history, as there are apparently only 2 known building emblems remaining (one on Cordiner's Land, and one on a building in the Cannongate at the bottom of the Royal Mile). 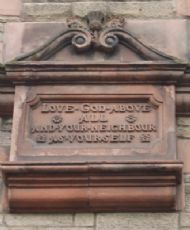 "Love God Above All And Your Neighbour As Yourself"
Cordiner's Land eventually fell into disrepair and suffered neglect for many years. 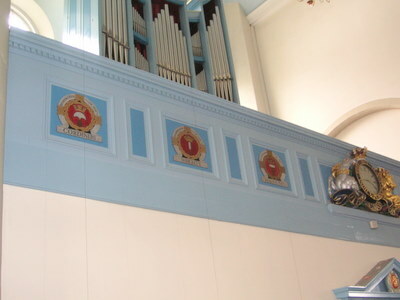 It was again refurbished (and modernised) in the 1980's. It now comprises 3 main separated buildings, as listed below, but preserves some of the original features of external balcony walkways, open staircases, terraced courtyard gardens, a tower and bridge. 3: the 2 storey individual dwelling house (formerly the 'Signal House') located to the rear of the gardens. ABOUT CORDINERS The word Cordiner derives from the French word for shoemaker, Cordonnier. Cordiners were leatherworkers, mostly shoemakers who made a complete new shoe, whereas cobblers worked with old leather and repaired shoes. The symbol of the cordiner is the half moon leather worker's knife, which when linked with a Crown indicated membership of the Cordiner's Guild. Shoemakers were also known as Cordwainers in England, and Souters in Scotland.